This whole week is going by so fast. I can't believe that it was a week ago that I left for Boston! Not running this week has made me feel like I have so much more "free" time, but I can't really say I've been super productive. Anyway, I really wished I didn't add that "Slim" before "Katie", so I've decided to drop the Slim. It sounds like it would be really simple, but I used my blog email address as a sign-in for a lot of sites, and it's all over my blog, so I've been slowly but surely changing it over. In the process, I logged into the email address Katie (at) runsforcookies (dot) com, which I had created a couple of years ago in case someone typed that by mistake, and I noticed a big problem. I had set the email to forward everything to the SlimKatie one, and there were several emails that were never forwarded. Which meant I never saw them. Heather, one of the bloggers that was at the Heartbreak Hill Half & Festival, wrote a great post about her experience during the half-marathon. Heather is normally a pretty fast runner, which she explains in the post, but she was sick the morning of the half, and wound up finishing next-to-last. Her experience was very different from someone in the middle to front of the pack (not in a good way), and sadly, it happens pretty often during races. I experienced being in the back of the pack before, too. I think some races do a much better job with it, and some races just seem to "forget" about the back of the pack. But like Heather mentions in her post, all of the athletes pay the same registration fee, so they should all be entitled to the same experience. Unfortunately, it just doesn't work that way. I'm hoping that her post will really help open the eyes of race directors (who can take it into consideration while planning races), as well as the people in the front of the pack (who just aren't aware that this is going on). 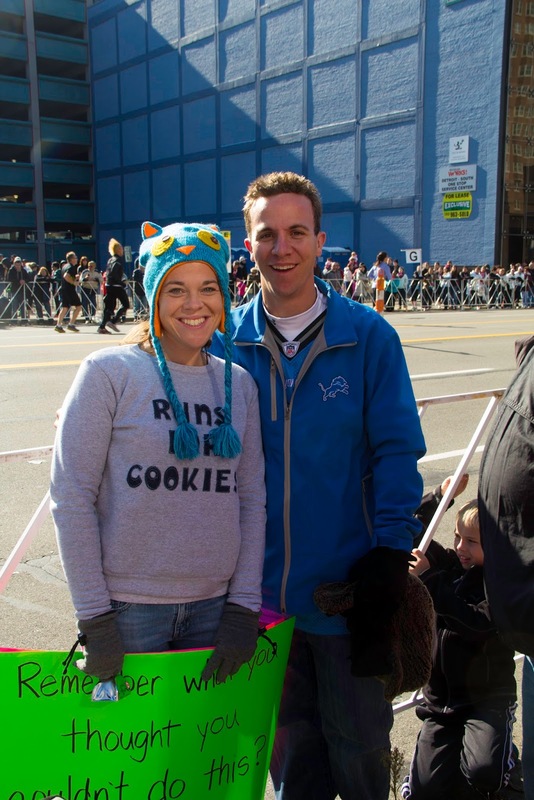 When Jerry and I went to the Detroit Free Press Marathon in 2013 specifically to cheer on every single athlete, I felt so sad for the people in the back. When I ran the marathon in 2012, and came out of the tunnel at mile 8, there were a ton of spectators cheering and ringing cowbells--it was awesome! I knew that's where I wanted to hang out during the race as a spectator, and we watched the first person come through, and then we stayed until the final walker came through. Jerry and I were literally the ONLY spectators still standing there when the last person came through that tunnel. We rang the cowbells and cheered, and the walkers bringing up the rear of the race thanked us and said that nobody ever stays to cheer for them. That was heartbreaking! They're out there nearly twice as long as the average runner, but they don't get to feel the excitement in the air and the hear the cheers as they work on a very physically challenging goal. I know there are some races that definitely cater to the back of the pack as well as the leaders, so I'm hoping that maybe in the comments here, we can compile a list. If you've been in the back of the pack at a race before, but had a great experience (all the water stations and spectators were still there, the volunteers were still out, etc), please leave a comment to let us all know which race that was. Personally, I think the Indy 500 Festival Mini Marathon (13.1 miles) is an amazing race for front and back of the pack runners. That's the race that I did when I was 253 pounds, and the cut-off time is 4 hours. I walked the entire thing, and finished in something like 3:52--definitely the tail end. But the experience was awesome! I noticed that the people in the back are usually a little more talkative, and it was fun to chat during the race (I'm usually super quiet, but I get very talkative during a race!). There were bands playing throughout the entire course, and none of them packed up to leave before the race was over. All of the volunteers and aid stations were still set up, with plenty of supplies. The finish line party was going full-swing. A great race, and I highly recommend that for a first half-marathon (or if you're just looking for a fun race). Any other suggestions of a good race, for fast or slow runners/walkers? Give them a shout out! My first half was great for us back-of-the packers!! It is the Great Lakes Bay Marathons. The time limit on the 1/2 is 4 hours and I finished in 3:16. The bands were still playing (2) and all the water/gu stations were fully functioning as well. There were spectators at the end in the ball park and lots of food and volunteers! It was great and pretty flat just 2 bridges (overpass height)! I had a good back of the pack experience at my first race, the Drumstick Dash 5K in Milwaukee, and an OK experience at my first half marathon, the Women Run Pewaukee Half. The staff/volunteers were still at the finish line when I came in around 3:15, but it was definitely not a party. Almost all of the participants (300ish) were gone, and the only people cheering were the handful of family members that were there to support us. Throughout the race, though, they kept aid stations going and cones up for the allotted time, and the volunteers were really nice. They stuck with the rule of the max pace, but they didn't push it at all. Unfortunately, they promised Gu at 3 points in the race and it was only there at the last station for me. That's good to hear that they didn't pressure you to pick up the pace. I'm surprised they ran out of Gu with a race that small, though! In Canada the Scotiabank Toronto Waterfront Marathon was pretty great for at the very least having very enthusiastic volunteers along the route which helped a lot, especially since it was my first full marathon (also it's a SUPER flat course so a nice one to start with)! I did the Med-City Half Marathon a couple weeks ago in Rochester, MN. We were definitely "back of the pack," but the race support was phenomenal. All the water stations were well stocked and were staffed by enthusiastic volunteers. This was my first half marathon and it set the bar high for future races. Sounds like they did a great job. I love races like that! The Brooksie Way Half Marathon is a Michigan Race I can recommend as being wonderful for all runners. I ran with several training groups who were a 3:30+ finish time. There was also a strictly walking group that paced near a 4 hr finish. The race has a training program that is open to all levels and walkers so they make sure everyone can finish comfortably. The race personnel make sure there are enough aid stations and assistance for everyone to finish. It was also ranked as one of Active.com's top fall half marathons. It is a beautiful course. The elevation change IS kind of kick in the pants, but the race is pretty amazing. The medals are also always super cool (which is always a plus). The entire Shamrock Marathon Weekend in Virginia Beach has been great. We've been 4 years in a row. Slowest times have been a 3:02 half and a 1:26 8k (walked the 8k when my wife was pregnant with our son). After every race we have gotten bananas, cookies, medals, hats for the half, Irish Stew, beer including during the race, bands for hours, and starting in March 2015 you can do all three races. Highly recommended. We always volunteered with my little brothers soccer team to manage the water station at mile 21 of the midnight sun marathon in anchorage Alaska and I wouldn't have picked any other aid station to be at! Imagine at least 15 teenage boys dressed in full on grass skirts and coconut bras. Music was played loud, and when it got to the walkers at the back they would run out to them and walk with them a while and talk to them. They gave the cute girls dances and the little old ladies (there were always a few) at the back of he pack were laughing the entire time they passed by. Their energy transferred to the athletes completing the marathon and it was always such a fun environment and atmosphere. They all stayed until the last runner/athlete passed through. That sounds like SO MUCH FUN. Almost makes me want to go to Alaska and run a marathon! ;) I'm sure all the runners appreciated what your little brother and his team were doing! The Detroit Women's Half Marathon was great for back of the pack. They had an announcer saying everyone's names when they crossed until everyone crossed. There wasn't a large crowd at the 3:15 mark when I finished but there were still people there. And every aid station was stocked and manned with super happy people, including the last one that was run by a high school girl's cross country team. They ended up joining up with the last woman on the course and finishing with her. I think it helped that the race course was able to stay closed for as long as they could with it being on Belle Isle. I would definitely recommend it for a first timer. That sounds great! I was thinking of doing that race this year. I love that the cross country team joined up with the last woman so she didn't have to be alone finishing last. Nice camaraderie! I have done a few 5KM runs, I was always dead last in all of these, exept for 1 5km race where I was just behind this other girl thru most of the race, and I so wanted to beat her. We were coming up to the finish line, just her and I, the crowd was still there, and they started yelling and cheering, it lit the fire under both of us, and the race was on, two short fat girls sprinting towards that finish line with all of our hearts in it. I managed to pull ahead at that last second to just pass her, and it was the best feeling ever! I did have to keep running around the corner so I could barf, lol...I put everything I had into it. I'm not sure if I would have been so competitive for that race if there weren't people around cheering and making it seem like we were competing for 1st place, not deciding who would be 2nd last and who would be dead last. Wow, I can see how that would get you moving! A no longer active local running club used to give out the "turtle award" to the last finisher in a race-and yes, I earned that award! They also used to do a middle of the pack award. A trophy for the exact middle finisher. The only big race I run regularly is the cooper river bridge run (40,000 runners) and they are pretty good about having everything set up until the end. The turtle award and the middle of the pack award is a really great idea! And I think the large races like that do tend to be better about sticking around to the end. The 500 Festival that I mentioned is really big (35,000). I liked Chicago Marathon for back of the pack. There are some really awesome folks on the south side through mile 24-25 who stay there and cheer for EVERYONE. And I really needed it at that point. Also - Women's Half Marathon, which this year will run down the Magnificent Mile in Chicagoon Aug 31 is an amazing race. I love all the support from my fellow lady runners and from all the guys on the sidelines. You know those "worst parade ever" signs? Well last year I saw a guy holding a "Best Parade Ever!" sign with a picture of a bra on it and it made me giggle. I was STUNNED at the sheer number of spectators at the Chicago Marathon! I was in the middle of the pack, but everything seemed to be very well stocked through the race and at the finish. It was definitely a great race! I did the Historic Half Marathon at Fredericksburg, VA in 2012 with my brother and my Dad. 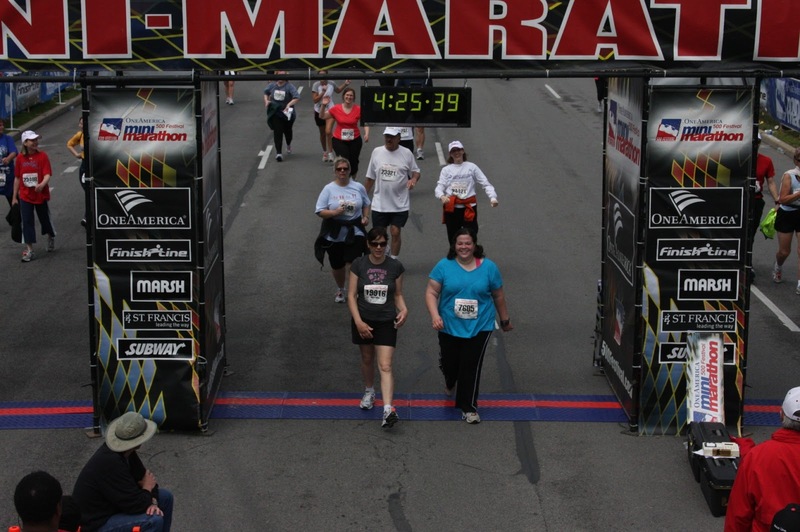 My dad and I were not last but we were among the last 50 people to cross the finish line. A group of marines ran out and joined the last walker as she crossed the finish line. It was the first time I ever wished I was last. Very inspiring. That would have been amazing to see! My first marathon was the Chicago Marathon last October and it took me about 6 hours and I loved every minute of it! They did a great job keeping me motivated! I agree! Chicago is a great race. I'm so glad you had a great first experience! Katie, you are too nice. Don't worry about my motivational Monday post, it was no big deal, and so many people accomplish such great physical feats, my small victory over a buffet was definitely nothing. It's funny that I evidently sent my e-mail to the address you are actually using now. Still love reading your blog every single day! Pam, the buffet was a HUGE accomplishment for you! Thanks for sharing! One recommendation for a first 10k or half marathon is to look for ones that are part of a full marathon. That way, no matter how slow you finish the 6.2 or 13.1, there will be people cheering on the full marathoners. My slowest half marathon time was 3:20 and there were still a ton of spectators, volunteers, etc because it was with a full marathon so there were lots of runners still out there. That's a fantastic idea, Kim! The Nike Women's half in D.C. was fantastic for the back-of-the-pack! I crossed in over 3 hours (3.5 hour limit) and they do a great job through the whole race. There were supporters and bands from local colleges that had just as much energy as I assume they did at the beginning. There was one sign I saw 3 times throughout the race; he kept moving to different areas of the course and stayed for hours. There are little things that makes you feel great, no matter where you fall: a video feed that showed you at the half way point said "Smile, you're halfway done! 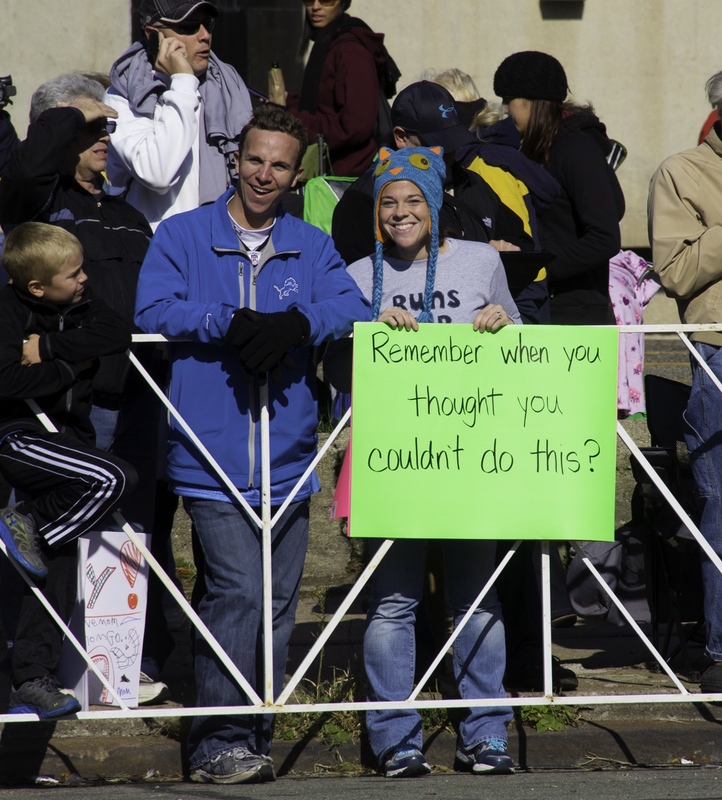 ", an announcer cheering you on and calling your name in an area where there was less support from spectators around mile 8-9 and at mile 13, a huge LED sign that gave you a personalized motivational phrase when you crossed a time pad. All around an amazing race from the packet pick up to the Tiffany's necklace at the end! That sounds like an awesome race! I'd love to do it someday. (The INDY 500 mini is much larger and more established.) I walked the Indy Monumental Half last November with my mom, dad, and boyfriend. My mom and I have walked a few half marathons, but I was disappointed that at mile #2 they were hustling us along when we were maintaining the pace very well (finishing in 3:20 of 4:00). The timing went off of the start time, not the time the later corrals start. We had them tailing us for quite a while, and behind the tail everyone had to walk on the sidewalk. It was unfortunate and forced my boyfriend to push himself too much instead of enjoying it; I don't think I'll ever get him to do another with me. That's really unfortunate! I'm surprised they were pushing you, because I think there is a full marathon that same day, right? Regardless, sorry about that experience! I also check the previous years race results. With some of the smaller races especially I see when the last person finished for the last couple years. I don't mind being the last, but if I am going to finish 40 minutes after everyone else... well that's a race where I am guaranteed to be out of luck with aid stations and course support. This website also gives names and dates of marathons and half marathons that are friendly to slower participants. I'd also recommend the Grand Rapids Marathon--based on their awesome website and some great recommendations from friends. They do a early start for "velocity challenged runners/walkers. The FAQ is hilarious. And they have also pacers for all kinds of crazy times like Pi (3:1415926), Beat Oprah (4:29:20), 4:44:44, etc. When I eventually run a full marathon-- this will be the course I do it at. My 8 year old did her first 5k this year for Girls on the Run. She was the 2nd to last person to finish. I was devastated that they had packed up everything. The awards ceremony was over. My husband who walked it with her said all the water stations were packed up. A few very nice volunteers stayed to cheer for her & hand her a metal. They knew this race was for young girls & that for most this would be the first time. It was really disappointing! Deb, that makes me so sad! I hate to see ANY race pack up before the last person crosses the finish line, but it is especially disheartening to hear that a Girls on the Run race did that! I hope that you contacted the race director.